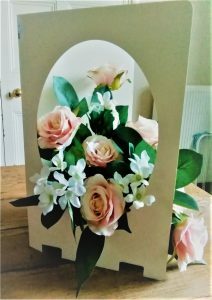 Live flowers arranged within a card, these are slightly bigger than an A4 sized piece of paper. Your message can written inside the card for you. 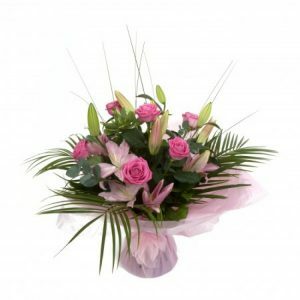 Your arrangement can be placed within your room or presented at a pre-arranged time at your request. Colours and flowers shown are representational. Actual flowers and colours are dependant on season. All requests are taken, but are dependant on availability and timescale given. 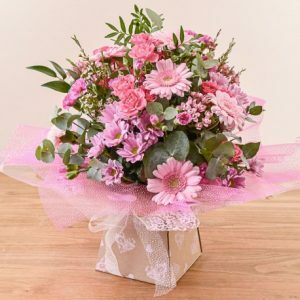 A hand-tied bouquet wrapped and able to stand up by itself. Enough water inside to keep for a few days before you get them home. 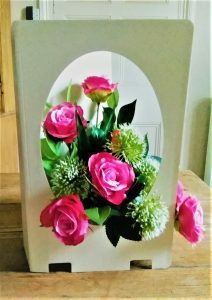 We suggest that you book as far in advance as possible, especially if you have specific requests as we cannot guarantee that the local florists will be able to accommodate. Should any special requests incur any extra charges to those specified we will contact you first before proceeding with the order. Payment will be taken on booking.